A New Post – at last! Anyway, I’ve been downloading books onto my Kindle (thanks, Son One),and following http://www.dovegreyreader.co.uk/ as she and a large number of readers blog and comment on Middlemarch by George Eliot. I discovered that a certain selection of old (pre 1926) novels and books are available on kindle for, well, nothing. Middlemarch, Pride and Prejudice, and a lot of Anthony Trollope novels lurk in a very readable form. As I am struggling to carry even paperbacks around with me now, a kindle does mean that I can read something interesting while Northernvicar goes church hunting or train chasing. No, I haven’t sold out. I am still acquiring real books at a good rate. Father Christmas brought the three new Persephone books, so my collection is up to date, and I’m still keeping up with the Slightly Foxed limited editions. Apparently they are bringing out some of these in paperback, which is good as I have felt guilty about reviewing books here that are only being produced in limited editions. More details here http://www.foxedquarterly.com/news/. The Holman-Hunt book which is coming out will be very appealing. 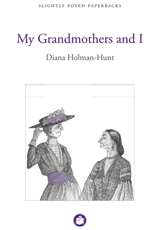 Diana Holman Hunt wrote My Grandmothers and I as a memoir of her life with her two grandmothers. The artist’s widow was one of the grandmothers, and probably one of the most eccentric grandmothers on record. It is a funny little book, which I enjoyed as a complete opposite to most modern childhood memoirs. The Slightly Foxed Quarterly is addictive, too. Definately worth investigating…. Leave a comment A New Post – at last!